When your face feels dry and tired, you can use a misting spray to invigorate and restore moisture to it. Although the main ingredient in a facial spray is usually water, it also may contain herbal infusions, scents, aromatherapy oils and some antioxidants. 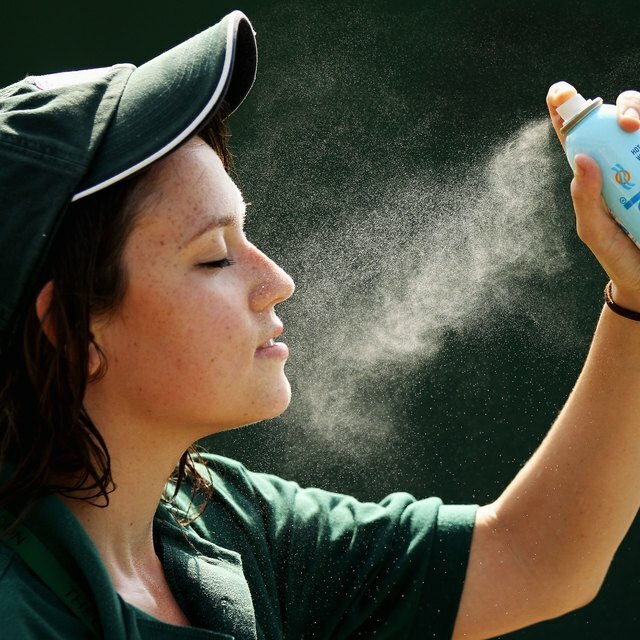 Many organic or drugstore-brand facial-mist sprays can be expensive. A cost-effective solution is to make your own facial mist with simple ingredients you may already have at home. Pour 2 cups of water into the pot, add the herbs and place the pot on the stove to heat the ingredients. Allow the ingredients to boil for approximately 15 minutes and then turn the heat off. Let the herbs steep in the water for 10 minutes, then strain the herbal mixture into the open jar and cover with the lid. Store the liquid in the refrigerator until ready to use. It can be refrigerated for up to two weeks. Pour the liquid into the bottle and spray your face whenever needed. An alternative option is to wet a cotton ball in the liquid and apply it to your face. This facial toner may useful for oily skin types, suggests the website Natural Skin Care Recipes. While chamomile may be useful for dry, normal and mature skin types, you also can try other different herbs based on your specific skin type. Place the funnel into an open spray bottle and pour in the distilled water. Add five drops each of the rose and lavender essential oils into the bottle with the eyedropper. Remove the funnel, replace the spray nozzle and close the bottle. Shake the bottle to mix the essential oils and the water. Spray your face with it. Lavender and rose essential oils may be beneficial for most skin types, but you also can use other essential oils for your specific skin type. Design your own facial mist spray by experimenting with different essential oils, herbs or by adding ingredients such as aloe vera juice, lemon peel, grapefruit and witch hazel. Because some people may have allergic reactions to certain essential oils for various reasons, it is advisable to do patch testing before using these oils. Avoid applying lemon or certain other citrus essential oils topically because they may produce a phototoxic effect on the skin. University of Minnesota: Center for Spirituality & Healing and the Life Science Foundation: Are Essential Oils Safe?